It’s challenging to count the ways in which the UK general election 2 days ago failed miserably on objective measures of democratic health for a country. I’ve tried to pick the most egregious. We now have a conservative majority government based on 36.9% of 66.1% turnout, i.e. 24.3% of the voting public. Some countries with more serious voting systems like Australia, which has preferential voting, (which is not a proportional system, but doesn’t waste votes in the same way as FPTP), and Brazil, also make voting mandatory. Others nevertheless have higher turnouts, including key countries in Europe. The UK turnout is far from the worst (the US turnout is typically in the 40% range, a reflection of the disconnect between the population and democracy), but it’s still poor for an election that generated greater than usual public engagement. We don’t know what the result would have been if that other 30% had voted, but the usual assumption is that people who don’t vote but do care, at least to some extent about the result, do not do so because the plethora of polls published in the run-up to the election roughly represent their preferred outcome. However, in this election, the polls were massively out (predicting a neck and neck Lab/Conservative race). Friday the 8th may have been a day of some regret for those who did not vote – especially as non-voters are far more likely to be poorer people whose interests won’t be served well by a Conservative government. 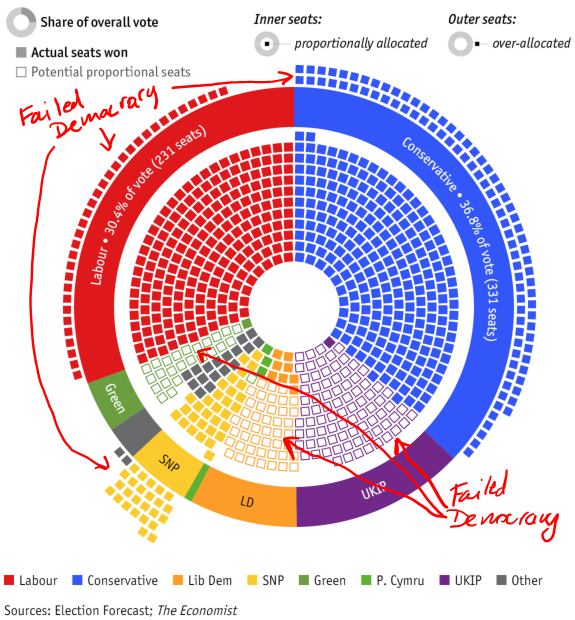 IN BRITAIN’S “first-past-the-post” electoral system, seats won at a general election are not shared out between the parties proportionally nationwide. Instead each one of the 650 constituencies is self-contained, meaning any vote not used to win a seat is in effect wasted. UKIP received 3.9m votes, but only 1 seat; proportionally, they should have 83. The Greens received 1.16m votes, but only 1 seat; they should have 24. The Lib Dems received 2.4m votes, got 8 seats, but should have 53. The SNP received 1.45m votes, got 56 seats, but should have 37. The vast majority of people vote in general elections for parties and platforms, not the local candidate (they vote for local things in council elections) on their individual merits. The graphic at the top, from the Economist, shows beautifully the level of failure of the British FPTP voting system. 20% of the votes are not represented at all in Westminster. The Liberal Democrats wipe-out should not have happened. And – much as I dislike their policies – UKIP should have nearly 90 seats, but have only one. The evidence could not be stronger for converting to a proportional voting system, as used by most countries around the world in some form. On last night’s post-election Question Time, Francis Maude stated that he thought the system where people vote for a local candidate and the one with the most votes wins, and that decides the result was the fairest, in contrast to all the other panelists including John Swinney, SNP, a major beneficiary of the unfair system. No intelligent person could hold that view with respect to a general election in a modern democratic nation; it can only be understood as evidence that there is no credible intellectual justification for the system. The Liberal Democrats wipe-out … a case of political illiteracy? The Liberal Democrats, a party that is pretty non-ideological, only marginally tribal and champions rights and freedoms that hardly anyone can argue with, was wiped out, going from 57 seats to 8. Ignoring the fact that the number of seats doesn’t represent voter intention across the country (see above) for a moment, we have to ask why this happened. The Lib Dems are home to some of the wisest, most balanced and intelligent politicians in the country, including Vince Cable, Simon Hughes, Norman Baker, David Laws, Charles Kennedy, Paddy Ashdown and many others. Most of them lost their seats. For what? The prevailing opinion on this is that they paid the price for one major mistake at the start of their coalition with the Conservatives: reversing their pre-election promise not to raise university tuition fees. This reversal was not seen in the same way had it been Labour or the Conservatives who had backtracked; the Lib Dems have been vilified for 5 years, treated like Judas Escariot. This is manifestly unfair: they didn’t invent student fees (Labour did that) and didn’t feel they had much choice in the early days of the coalition but to go along with the Conservatives, since they realised that succeeding on other things they saw as higher priorities (electoral reform, Lords reform, raising the tax-free threshold) would require some compromise. It is clear nevertheless (there are 5 years’ of panel programmes, polls and online comments to prove it) that a huge swathe of the Lib Dem support base wanted to punish them for their ‘treachery’. The psychology behind this is not immediately obvious but it is explainable: it’s most likely because the Lib Dems correspond, for their traditional support base, not only to a party of equal rights and fairness, but to a party of protest and opposition, whose pure motives never need be sullied by dirty compromises required by being in government. But they did go into government, and instead of being sideline critics, they shaped many of the better policies (and curbed some of the worst excesses) of the Tories in the last parliament. To do this, they compromised on various things. why were the Liberal Democrats punished for the failures of the last government, and the Tories rewarded for the successes? Paddy Ashdown as understandably at some loss to explain, but did ask in return what party of principle will in the future enter into a coalition in order to keep a major party honest and fair in the future, if this is the way it gets treated by the British voting public? British voters who believe in the principles of the Lib Dems but voted Conservative two days ago should be ashamed. They traded one night of smug satisfaction for 5 years of the Tories, now unfettered by any reasonable party. I can only conclude that the number of people in the country who simply don’t understand how politics works is far higher than I had realised. The case of the SNP: nationalism, Tory retaliation or self-determination? The SNP, led by Nicola Sturgeon, surely the blueprint for female politicians in the future (or maybe just politicians), won all but 3 seats in Scotland. They benefitted significantly from the non-proportionality of the FPTP system, but also from the lower population in each electorate. Regardless, this result has to be seen in somewhat geographical and arguably even cultural terms. Scots voted for a party they perceive are really working for them, rather than what they perceive as members of the Westminster elite, i.e. the two major parties. The SNP and its voters were continually accused before the election of being nationalist, and not caring about the rest of the UK, wanting to sail off on their own, all of which are clearly vacuous and untrue. I doubt if you could find a Scot who doesn’t want the other three nations of the UK to be doing well, and to be on the friendliest of terms in all senses with Scotland, whether he/she is for independence or not – that’s just common sense. The nonsense spouted by the press, and particularly the Labour campaign is a sign that they just don’t take the need for self-determination seriously, for this is the real basis for the SNP’s success. Scots rightly saw the duplicity of the two big party machines, and voted for the closest thing they could get to strong representation in Westminster. If they eventually choose full independence one day, the Tories and Labour only have themselves to blame. I think they have voted with somewhat rose-tinted spectacles on, and could well regret removing the Scottish Liberal Democrat MPs, but time will tell. I say good luck to them: under Sturgeon’s feisty leadership, they may well be the main source of inspirational democracy in the coming five years. Online petitions for Proportional Representation have already started, and I predict the calls for a fair voting system will continue for some time. It’s hard to take British politics seriously until this problem is addressed – everything that happens in this parliament will be on a largely false foundation. Until it is, many people’s interests will not be served, since they have no voice in parliament, and the general cynicism for big party politics will remain. Countries like the United Kingdom and the United States love to go on about democracy, and love to think they can teach the world how to do it, and in the US’s case, love to ‘export’ it. However both political systems are now fundamentally unsound, and represent no blueprint for re-use, in fact they are shining examples of what not to do for other countries. Making progress from here can rely only on grass roots efforts that go around the outside of the current rigged political system. This entry was posted in Politics and tagged election 2015, lib dems, snp, tories by wolandscat. Bookmark the permalink. “some of the wisest, most balanced and intelligent politicians in the country, including Vince Cable, Simon Hughes, Norman Baker, David Laws, Charles Kennedy, Paddy Ashdown”: Thanks for the belly laugh, though I assume you didn’t intend to be humorous. It wasn’t tuition fees alone that did for the Lib Dems (only a sheltered middle-class Guardian reader could believe that), but the sheer naked opportunism and hypocrisy they displayed throughout their five years propping up the Tories. What voters rightly loathe is two-facedness, which is all that your “wisest, most balanced and intelligent politicians” had to offer by 7 May. These will all be reversed by the Tories now. Happy to listen to any evidence you can provide to support your assertion.